Overhead aerial of the gun battery at Mont Fleury, behind 'King Red' Beach GOLD Area, after air bombardment, showing four medium casemates under construction. 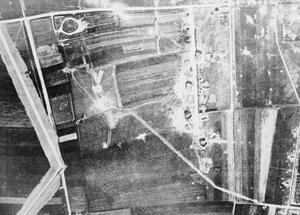 Note also the anti-tank ditch, (right), and minefields, (centre top). The battery consisted of four 12.2 cm Polish guns (one in a completed casemate) manned by elements of the German 1260th GHQ Coastal Artillery Battalion, and was captured on 6 June 1944 by 6th Battalion, The Green Howards.